Antibiotic superbugs were once an anomaly, but now they contribute to a massive and looming health crisis. Help send a message to some of the biggest users of meat raised on antibiotics — McDonald’s, KFC, Wendy’s, Burger King, and Subway — to help reverse this public health challenge. Antibiotics are being used irresponsibly by the agricultural industry to raise cattle, pigs, and other animals without concern for the health crisis that these drugs have created. Most factory farms don’t just give animals antibiotics when they are sick, but routinely include them in their daily food supply. The fast food industry supports this practice by purchasing and reselling billions of pounds of meat that have been treated with antibiotics to customers at their restaurants every year. Some retailers, like In-N-Out Burger, have already committed to removing meat raised on antibiotics from their stores. Subway has made promises to remove some antibiotic-laden food from its menu in 2016. If a few popular food retailers can do it, so can other major fast food chains. This would make a big difference in the superbugs that are being created, threatening public health due to the practices of a few large companies. The Center for Disease Control (CDC) admits that “there is strong evidence that some antibiotic resistance in bacteria is caused by antibiotic use in food animals.” It is time for fast food chains that serve millions of Americans every year to do the same. About 80% of all antibiotics sold in the U.S. end up in animal feed. Antibiotics are more often put in animal feed to ‘fatten up’ the meat, not to control disease. Superbugs are strains of bacteria that have grown immune to the antibiotics that doctors prescribe, making it much more difficult to treat illnesses. Resistant bacteria that develop in CAFOs (confined animal feeding operations) can be transferred to the human population via food they eat at fast food stores. There are 76 million cases of food borne illness every year that can be traced to resistant bacteria. 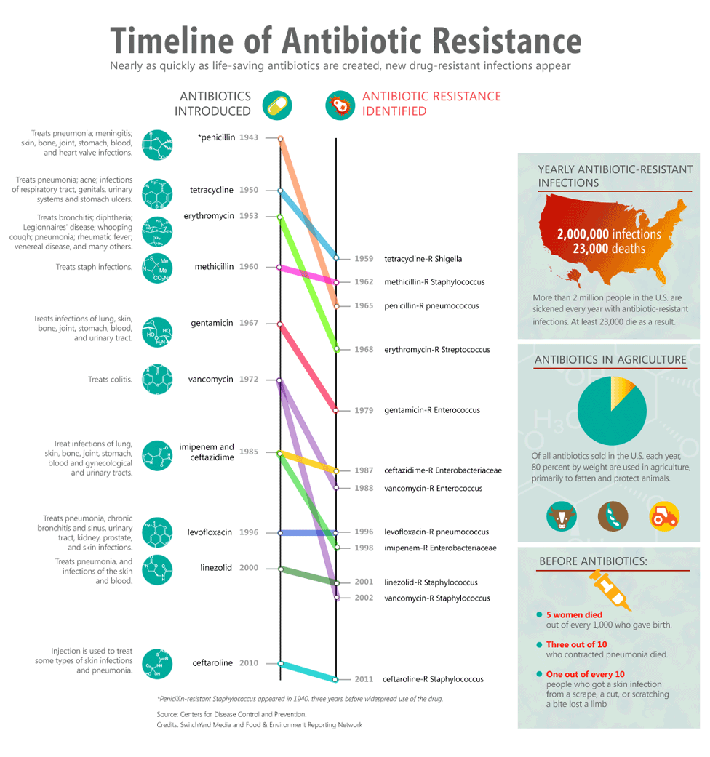 Dramatic evidence of superbug persistence can be found in the FDA approval of fluoroquinolones–a class of antibiotics that includes Cipro (ciprofloxacin), which has been used in poultry production since 1995. In both 2006 and 2010, over 60% of tested chicken samples contained Salmonella and/or ciprofloxacin-resistant Campylobacter, a disease-causing bacterium. It is unknown how many samples would contain these bacteria today. The use of antibiotics at factory farms is also used as a substitute for clean and dignified living conditions for the animals; most animals that are fed feed full of antibiotics live in absolute squalor. The American Medical Association, American Public Health Association, Infectious Disease Society of America, and World Health Organization agree in calling for huge reductions in the use of antibiotics for animal food production. This problem is so large that Beth Gardiner, author of “Taking on the Superbugs,” says that if the use of antibiotics continues unchecked in the agricultural industry, more people could die from superbugs by 2050 than they do of cancer. As of this writing, almost 57,000 people have signed a petition to demand that the fast food industry stop supporting the superbug-creating practices of Big Ag. You can add your name to the petition here, or you can write to your local fast food chains and tell them that this practice can be tolerated no more. Usually these big companies don’t make major changes unless they are forced to by public pressure and vocal grassroots movements that hold them accountable for their actions. If you don’t want to get sick from the latest slew of superbugs, it starts with making sure that animals are not fed antibiotics throughout their entire life cycle. We all deserve to eat at restaurants that aren’t helping to create a public health crisis, and that source their animals with respect. It is through our collective actions that we will help these companies finally hear the message activists have been sharing for years now. You can also watch Will Harris, a fifth-generation farmer from Georgia, describe the problem with over-using antibiotics. Just pointing out another of Chrissy’s lies. Just maybe she requests her food raw at these fast food joints, but I prefer mine cooked which to the point the bacteria is actually killed whether resistant or not. How stupid can she be? I’m sure spud will try to defend her, but then again he has about the same iq level. Fact: Actually, the possibility of bacterial growth actually increases after cooking, because the drop in temperature (after food is removed from the heat) allows bacteria to thrive. This is why keeping cooked food warmed to the right temperature is critical for food safety. True food temperature must be maintained, but you missed the point. That isn’t HER argument. She is either lying or totally incompetent. Your insults are very common and becoming well known as freelance operatives are exposed. CAFO’s are nasty dirty places run for Corporate profit. The use of anti-antibiotics merely allows the operations to continue to operate with the largest profit margin in regards to investment. Laws are being used to regulate the individual and family farming and livestock operations out of business and steal their land, instead of regulating the always poorly run and worst corrupt business of corporate for profit operations. As we follow the products, we’ll find that more corporate run operations pose more dangers, not the other way around. Fast food joints are for profit operations also, your uneducated attempt at attack only serves to prove the point, regulatory is now designed to destroy family owned in favor of corporate tyranny and control.